A magnetic field is a region of space in which a magnetic force acts. Things that are magnetic will be repelled or attracted to each other within this area. You can see the magnetic field lines around a bar magnet using iron filings. They make the pattern shown below. Iron is magnetic and so when it is brought near a bar magnet, magnetism is 'induced' in it. This means it will now act like a magnet. The iron filings then align themselves along the field lines. Magnets have two 'poles' or ends: a North pole and a South pole. 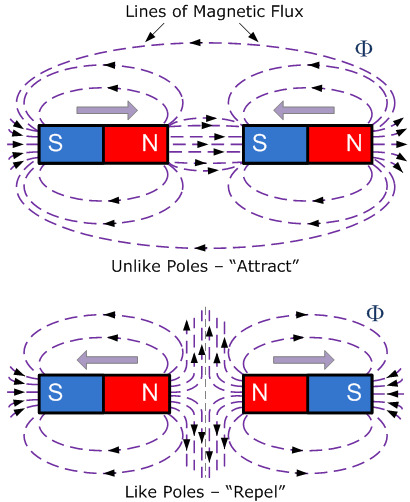 If two North poles or two South poles are brought together, the magnets will repel each other. If opposite poles are brought together they will attract each other and the magnets will want to stick together. Magnetic field lines are drawn pointing from the North pole to the South pole. You can make a magnet by stroking a material, like iron, with a magnet or by using an electric current. Metals that can be magnetised are known as soft magnetic materials: iron, cobalt, nickel and steel. These are also the materials that will be attracted to magnets. A coil of wire has a magnetic field when current flows through it. You can find out what the field lines look like using the right hand grip rule shown on the left. Remember: this means that two wires could repel or attract each other. We can strengthen the magnet by wrapping the coil of wire around an iron core. The current in the coil induces the a magnetic field in the core. This field could then induce a magnetic field in another object. The core will only be magnetic while the current is on. We can increase the strength of the magnet by increasing the voltage or the number of coils.